One of Columbia County's most-heavily watched industrial tenants is getting even more scrutiny, as Global Partners LP requests a change in the classification of liquids it can transport. Port of Columbia County commissioners listened to nearly two hours of discussion from Global reps and fire and oil spill response teams Wednesday, Nov. 14. Commissioners are considering the company's request to modify the terms of its lease with the port to allow for a wider range of API — the petroleum industry's standard for rating the viscosity of fuels, or gravity of oil, relative to water. That's important when determining how easily fuel can be cleaned up after a spill, hazard response experts said Wednesday, noting heavier, denser fuels are often easier to clean up than those that disperse quickly. The amendment to Global's lease would give the company the ability to change products under certain restrictions or "respond to market conditions" in response to the fuels industry, company leaders say. "The proposed lease amendment gives Global the flexibility to respond to market conditions," Catie Kerns, a spokesperson for Global Partners, stated via email to the Spotlight. "It does not increase the rail traffic limit or change the type of commodities we are permitted and approved to move. With the right conditions, this has the potential to generate an investment of up to $75 million or more at the Port and increase employment to 40 full time employees." It was a response to fluctuating market conditions that led Global Partners, which operates Columbia Pacific Bio-Refinery at Port Westward, to shift its business in Columbia County from transloading crude oil by rail to transloading ethanol. Global Partners utilizes a rail line that runs along Highway 30 from Portland all the way to its facility at Port Westward near Clatskanie to move fuels it transports by ship. If the company's lease amendment is approved, there's a possibility Global could go back to shipping crude oil through Columbia County, but that isn't likely to happen right now, the company says. "There are no specific plans at this time and we will continue to move ethanol in the immediate future," Kerns stated. Currently, Global Partners holds permits to ship ethanol and crude oil. The company's lease agreement with the port also restricts the API of the commodities it can transport, but stipulates that restriction could be lifted, contingent on the company's "safety, performance, and spill management history." It was that key language that led to Dylan Remley, Global's senior vice president of terminal operations, to bring a horde of presenters to talk about everything from oil spill response to fire prevention, rail car safety and regulations. "We already have all the equipment in place to exceed any response standards," Casey Comer of Clean Rivers Cooperative said Wednesday. 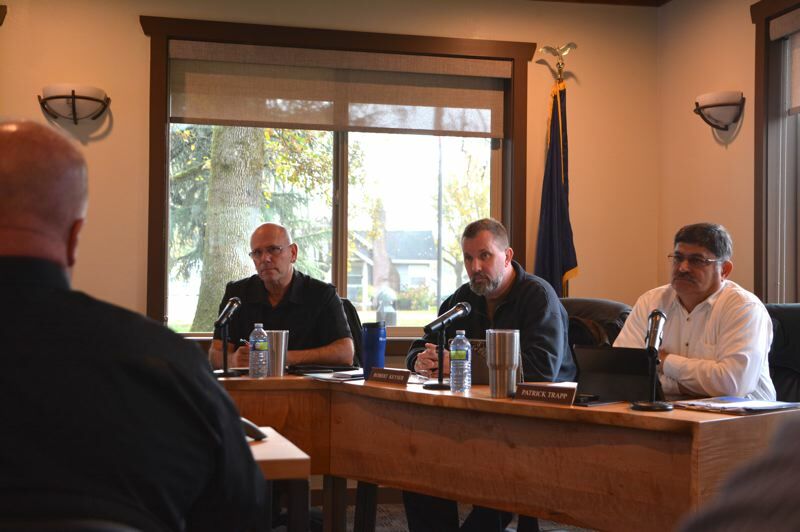 Commissioner Larry Ericksen inquired heavily about how changes to the lease would impact traffic, noting Columbia County's "problems with transportation" and the impacts increased rail traffic would have on that. "In Scappoose, we've got fire on one side of the rail and police on the other, and there's not really a good way to mitigate that," Ericksen said. "If I seem a little concerned about how this affects the livability and how people can get around, this affects people every day. These are big issues, they're not trivial issues." Global reps emphasized that there is no planned increase in rail traffic. "We have an authorized train count," Remley said. "We're not asking in any way for that to be amended or modified, we're simply asking for that API rating to be removed, and the sole purpose is to give us greater flexibility." Kevin Haugh of Genesee & Wyoming's Western Region told commissioners his railroad company has "put millions and millions of dollars into the main line to make it the safest it could be." Haugh said his company believes rail speeds of 25 mph are "in the public's best interest."